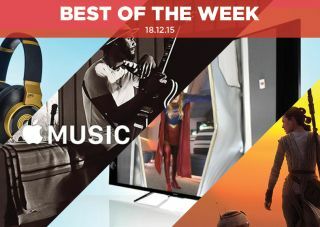 Best of the Week: Apple Music on Sonos, Sony 4K TV, Star Wars in 3D and more | What Hi-Fi? This week we had a sneak peak at one of Monitor Audio's CES offerings in the shape of its Platinum Series II speaker range, Apple Music entered beta on Sonos devices and Star Wars director J.J Abrams gave fans a reason to be confident in the film's 3D release. Elsewhere we had reviews in the form of Sony's gigantic KD-75X9405C 4K TV, the boomerang-shaped BeoPlay A6 wireless speaker from B&O and the tech-tastic N90Q headphones from AKG. This week also saw the launch of a new issue of What Hi-Fi? and the January 2016 issue is a very special one. The magazine has been completely overhauled, from new-look First Tests and Group Tests to a new and improved Buyer's Guide, that'll help you make the best buying choices. MORE: New-look January 2016 issue on sale now! It's been a long wait but Monitor Audio is officially set to reveal the Series II version of its Platinum speakers at CES in January. There are seven speakers in the range, starting at the PL100 II standmounters (£3150/pair) and rising up to the PL500 II floorstanders (£15,000/pair). The range will feature Monitor Audio's latest technology, the highlight being the Micro Pleated Diagraphm (MPD) high-frequency transducer, which it claims offers greater accuracy and efficiency than a traditional dome tweeter. If you're eagerly anticipating Apple Music on Sonos devices, your wait is over. Sort of. The streaming service has entered its public beta test phase with a full launch expected in early 2016. To test it you'll need to sign up at the website, and once in you can try out a number of features including Beats 1 radio station, For You and My Music. You may have heard there's a new Star Wars film out and according to its director, J.J. Abrams, some parts of the film look better in 3D. Abrams admitted he hadn't been a huge supporter of the format, feeling (ahem) forced, into delivering a 3D version of Star Trek in Darkness. But the director sounds more enthusiastic about how well Awakens (shot in 35mm) looks after its 3D conversion. "The KD-75X9405C is a thrilling television in many ways, and thoroughly deserving of a five-star rating"
Sony's 2015 range of TVs hasn't quite reached the lofty highs of previous years. However, it's finished 2015 with a bang. A big room is needed to hold this 75in, 4K behemoth but once you've managed it, this Sony offers breathtaking sound and vision. It's a TV that deserves high praise indeed - absolutely thrilling. "It’s a job well done in our eyes." You could spend £800 on a streaming system and a pair of speakers. B&O's BeoPlay A6 wireless speaker makes a convincing case for why you shouldn't. Oddly shaped – from above it looks like a boomerang – the A6 can stream pretty much anything from anywhere, features multi-room capability and a sound that's crystal clear and expressive. Though the controls and app could use some refining, it's a great alternative to the Naim Mu-so. "They’re beautifully made with high quality materials and pack in plenty of useful and unusual features"
The N90Qs are a cleverly engineered pair of headphones with a dose of celebrity, thanks to mega producer Quincy Jones's endorsement. Performance is elevated by very good sound and excellent noise-cancellation. Our only minor quibble is the lack of full-on fun factor.